​Health Impact Assessment is a valuable tool to help guide conversations about issues that may affect public health, that might not otherwise take these issues into account. It includes unintended impacts and community engagement to ensure all stakeholders affected by an issue are given a voice. 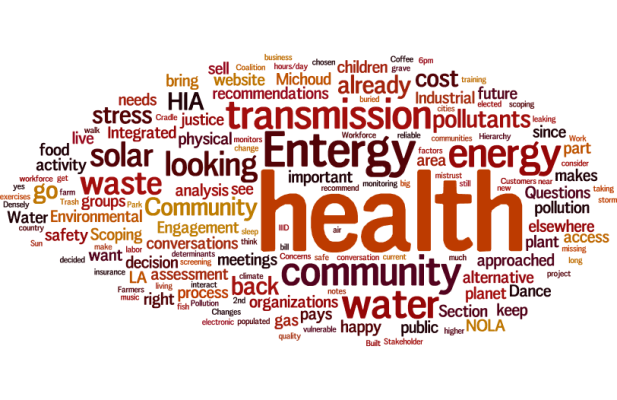 Louisiana Public Health Institute and the Alliance for Affordable Energy held an HIA training session, inviting decision makers and community members to learn about the HIA process. This assessment focuses on the eventual decommissioning of Entergy New Orleans’ Michoud power plant, a natural gas plant built in the 1960s, and the siting of Michoud and any potential replacement of the power from Michoud that may have potential health effects to the communities nearby. This will serve as a landing page for the HIA process, housing documents created to discuss the HIA. Updates will be made regularly.